EARRINGS - SARAH COVENTRY. "TAHITIAN FLOWER" IN PEACH FROM 1969. 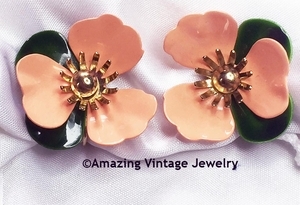 LARGE ENAMEL FLOWERS BECAME THE RAGE IN COSTUME JEWELRY IN 1969. THESE ISLAND-INSPIRED PEACH AND GREEN ENAMEL FLOWERS HAVE GOLDTONE ACCENTS. CLIP. ABOUT 1 1/2" IN DIAMETER. VERY GOOD CONDITION.